I can confirm that this application is recommended for approval and will be heard at the next planning committee 6th September 2018, the report will be available online on Friday. So unless the Councillors on the Planning Committee decide otherwise, ALDI will have the permissions they need for their new store in Coppice Farm Way. 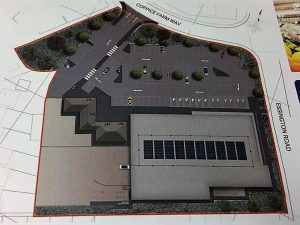 ALDI’s full application was lodged with the council in early May. Since then I have been pressing to get this to committee. Normally it would take 6 to 8 weeks to get it to Committee so it’s running around one month behind. This was due to a number of factors including the large amount of public interest and the traffic implications needed to be investigated. If all goes well at Planning Committee on the 6th September the ball is back in ALDI’s court to demolish the existing supermarket building and build the new one. ALDI did say originally that they hoped to get the new store open early 2019.